Current lead times are 2 business days. Central Maine Diesel Inc. (“CMD”) is not affiliated with, sponsored by or otherwise associated with American Honda Motor Company, Inc. (“American Honda”). 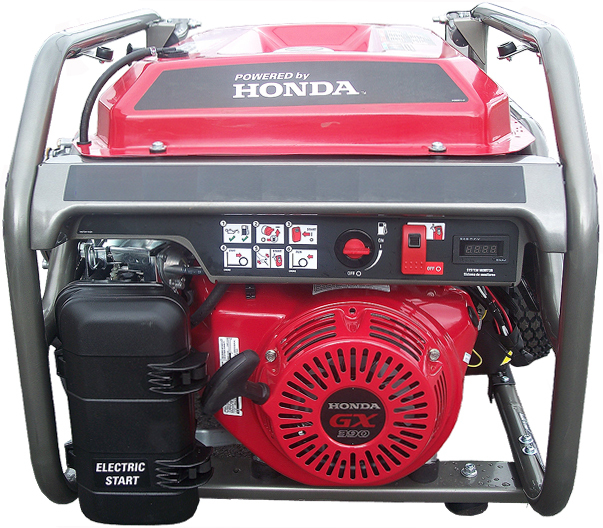 We purchase generators with genuine Honda® engines and modify them with CMD’s Triple Fuel System to operate on LP Gas, Natural Gas and Gasoline. CMD’s Triple Fuel System is not approved by American Honda. Honda® is a registered trademark of American Honda. 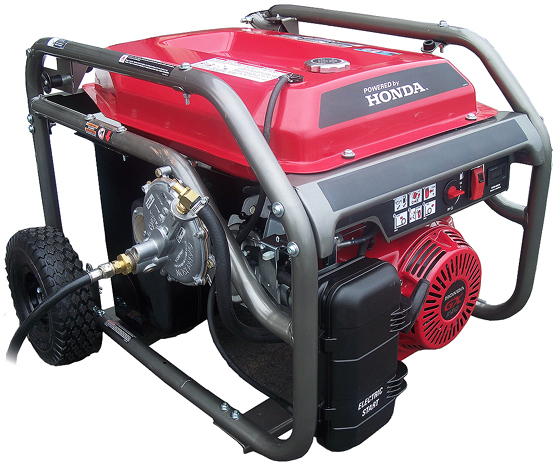 Honda Powered 8,750 Watt Gasoline Generator w/ Electric Start - This brand new Industrial Portable generator features an 8,750 watt surge rating and is designed for general use by the professional. This unit is designed for heavy duty service on the job site or as temporary stand-by-power. Turn a key just like you start your car. This brand new unit features a premium 13 HP Honda GX 390 OHV engine w/ a cast-iron cylinder sleeve and electric start. This genset is equipped with a "computer safe" generator, automatic voltage regulation, large fuel tank w/ fuel gauge, turn-key start/stop, muffler, rugged all-terrain wheel kit w/ rubber tires & dual folding handles, low oil pressure shutdown, 12 VDC battery and control panel with voltage gauge, frequency gauge, hour meter and electric start. Bore & Stroke 3.46" x 2.52"
American Honda Motor Company, Inc. makes no warranties about this product. All warranties for generators modified with CMD's Triple Fuel System are made solely and exclusively by Central Maine Diesel. Copyright © 2019 Central Maine Diesel Inc. All rights reserved.